The Oxford Movement sprang into life in the 1830s in reaction to the liberalisation of theology and in response to new freedoms for Catholics in society. It was an opportunity for Anglicans who regarded themselves as loyal to Rome, despite the interruption of the Reformation, to promote Catholic theology in the Church of England. A high doctrine of the Church and the sacraments, ritualistic worship and the revival of religious life - plus remarkable social work in slum areas - all characterise what we now call Anglo-Catholicism, still alive and well and accounting for a third of the C of E today. Here the writings of the leading lights of the Oxford Movement are introduced with a useful commentary and explanation. 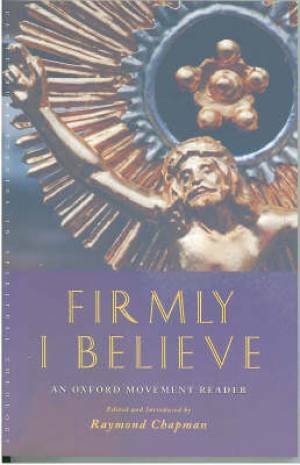 Firmly I Believe by Raymond Chapman was published by SCM Press in September 2006 and is our 70360th best seller. The ISBN for Firmly I Believe is 9781853117220. Be the first to review Firmly I Believe! Got a question? No problem! Just click here to ask us about Firmly I Believe.